The Peruvian Congress approved a packet of laws on July 3 which critics say subjects the country to neoliberal reforms that threaten to undermine environmental and labor protections and is a gift to the extractive industry. The Minister of Economy and Finance Luis Miguel Castilla first presented to Congress on this packet of laws on June 25 in order for them to be debated and approved. This has led to an outcry by civil society, as many have compared this law bundle to the neoliberal ‘paquetazos’ of the 1980s and 90s by the previous governments of Alan Garcia and Alberto Fujimori governments. President Ollanta Humala rejects this criticism. The term ‘paquetazo’ refers to a large bundle of laws supposedly aimed at reinvigorating the economy. In the days of the Garcia and Fujimori governments, the introduction of these paquetazos usually lead to hyperinflation, currency devaluation, extreme price hikes, and an increase in social conflicts and police repression. President Humala’s current attempt to reinvigorate the economy centers round removing any obstacles for investing companies (mainly in the extractive industries), which critics say will irreversibly damage the environment and fuel more social unrest. The most contentious piece of legislation promotes environmental deregulation and is seen as an attack on the authority of Ministry of Environment (MINAM) and its ability to effectively do its job. MINAM will be stripped of various key functions related to the setting and regulating of environmental norms. For example, it will no longer be able to approve the Maximum Permissible Limits (LMP by its Spanish acronym) and Standards of Environmental Quality (ECA), nor will it be able to establish reserved zones under the National Service of State Protected Natural Areas (SERNANP). Instead, these functions will be given to the Council of Ministers (made up of all the Ministers of the State), giving them a political, rather than a technical function. Out of the 18 ministers present on the council, the only one with any technical proficiency in environmental regulation is the Minister of the Environment; therefore diminishing his voice to equal standing among 17 others with little environmental expertise, and possibly with conflicting interests, is risking the integrity of environmental legislation. MINAM was formed just four years ago as part of the free trade agreement with the United States. Noticias SER states that this suggests that the desire to form a Ministry of Environment never really came from the Peruvian state but was rather an imposition in exchange for Peruvian access to external markets. Moreover, from the beginning, certain companies and business associations have seen MINAM, whose mission is “the conservation of the environment and the sustainable, responsible, rational and ethical use of the national resources” as a threat to their business interests. Thus, the weakening in this ministry is seen as a direct victory for the business sector. One of MINAMs fiscal bodies, the Organization of Environmental Evaluation and Control (OEFA), also found itself on the receiving end of drastic restructuring. It has been stripped of most of its power to fine companies that violate environmental standards. Now it can only do so in exceptional circumstances. Over the past few years OEFA has fined some big polluters, many of which also happen to be some of the country’s biggest investors. Argentinian Pluspetrol Norte was fined over US$ 7 million in November 2013 for “contaminating and disappearing” the Shanshococha lake in the department of Loreto. U.S.-based Newmont mining company, owners of the the Yanacocha gold mine with Peru’s Buenaventura, and with World Bank financing, as well as the Conga mining project, was fined five times, the most recently in August 2013 for over US$350,000 for the environmental destruction it caused as a result of its operations in Cajamarca. Peruvian Minera Volcan received a fine of tens of thousands of dollars for its contamination of Cerro de Pasco, while Anglo-Swiss Xstrata Tintaya was also fined for its environmental crimes in Espinar, Cusco. In protest of the stripping of OEFA’s functions, two lawyers, William Postigo and José Chirinoshave, resigned from its Environmental Control Tribunal. The new legislation also imposes a limit to the amount of time the relevant public bodies have to submit comments on Environmental Impact Assessments (EIAs). They now have only 45 days (it was originally proposed to provide 30 days) to read, assess, and comment. This has made the ability to make satisfactory commentary on EIAs extremely difficult. For example, the Minas Conga project owners submitted an EIA composed of 1,862 pages of technical language. It is useful to be reminded at this point that the Ministry with responsibility for approving EIAs is not actually the Ministry of Environment but the Ministry of Energy and Mines (MINEM), which has a vested interest in approving projects. MINAM, like any other ministry, can only comment. The Peruvian Ombudsman’s Office, charged with protecting the interests of the people, appealed to the government not to approve the slashing of environmental safeguards. The Ombudsman asked that the OEFA not be stripped of its powers to fine violators of environmental laws. He also asked for the fines to be used to remediate the damage caused by these violations. With regards to the EIAs, he recommended that, instead of cutting the time given to the relevant bodies to comment, the government should provide technical assistance to enable rigorous analysis within an appropriate time frame. Although the deregulation of environmental protection has stolen most of the attention in the discussion of the paquetazo, a huge chunk of the 180-page document expounds on the series of tax benefits that it will provide the private sector. US$ 7.2 billion of tax debt (an amount equivalent to almost double the nation`s health budget for 2014) will be absolved for 152,000 companies, 140,000 of which, the government emphasizes, will be small to medium-size companies. What the government doesn’t emphasize, however, is that $1.6 billion, almost a quarter of the total amount, has been accumulated between only nine major companies. The public has not been informed who the big debtors are, adding more fuel to the belief that this tax clearance is not designed to help the small and medium-size businesses, but rather benefits the large corporations who are the main beneficiaries of the paquetazo. The mining sector further benefited by a widening of the provisions in the 1993 Constitution for mining contracts with tax stability clauses, which includes expansion of existing projects as well as new ones. The government also lowered labor costs, perceived as another gift to big business, by cutting health and safety regulations for workers. The National Superintendent of Labor Control (Sunafil) can only fine up to 35 percent of the previous amount for labor health and safety violations. Additionally, medical exams that were previously given to workers three times a year will now be stretched to once every two years. Carlos Monge, a Peruvian anthropologist and historian, explains that these changes are part of a political strategy inherent in neoliberalism – when there is a fall in growth, Capital frees itself from its workers to protect its gains and the workers are left defenseless. An additional group will benefit from the paquetazo – the government authorities themselves. A section of the packet is dedicated to relaxing regulations concerning how state authorities spend state money. Now, all state contracts under a certain financial amount will not be regulated. On top of this, the previous regulation that state contracts cannot go to family members of state authorities has been removed. If some controversy does arise over state contracts, they will won’t be sent to arbitration like before, instead they will be sent to a newly created entity called the Board of Disputes Resolution, which does not have the same force. It appears that not only will the big corporations be allowed to act with impunity but also the government workers themselves. Criticism of the paquetazo has come from far and wide; from the people that will be directly affected by these laws to the highest ranking international institution. 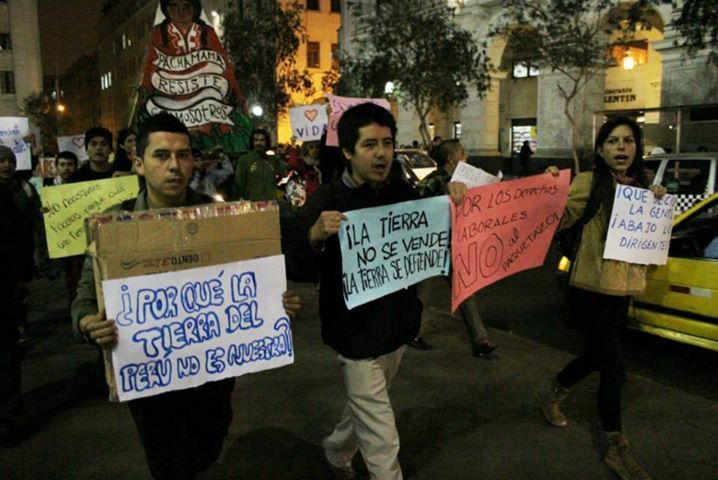 In a statement published by La Mula, 40 organizations classifying themselves as of indigenous and original peoples, social, workers, networks of human rights and civil society, and decentralized governments, expressed their absolute rejection of the proposed “economic measures for the revival of the Peruvian economy”. They highlight that the reductions in environmental protection violates numerous Peruvian laws – such as the Organic Law for the sustainable use of natural resources (Law 26821) and the Natural Protected Areas Law (art. 13). The issue of climate change is a very important one to raise, especially as Peru will host the Twentieth Conference of Parties to the Convention of the United Nations on Climate Change (COP20) this December. Many have pointed out the hypocrisy of the government of playing host to one of the most important events aimed to tackle climate change while it sells the rights to its country`s natural resources to some the world`s most climate damaging industries. Other international treaties violated by the paquetazo are the free trade agreements Peru has made with both the United States and the European Union. Both agreements contain clauses stating that neither party should attempt to promote investments by debilitating or reducing environmental or labor protections. [18, 19] The Environmental Investigation Agency (EIA) of the United States, in a communication, stated that “to debilitate environmental standards to increase investment, like these measures propose, is a direct violation of the obligations of Peru under the Treaty of Free Trade with the United States.” This is not to say these free trade agreements are free from criticism themselves, but even the minimal protections they offer for the environment and the workers are being violated. Taking up the point made by the UN representative about the model of development, many others also question the government’s stubbornness in sticking to this obviously flawed track. The aforementioned group of 40 organizations who spoke out against the new laws contradict the claim that the environmental and labor standards are slowing the economy. They put the blame squarely on the government and its failure to diversify the economy, and thus binding it to the volatile price of minerals. However, Anglo-American sociologist Anthony Bebbington sees thing slightly differently in that he accepts that certain institutional processes may slow investment, while he expounds that it is just such a system, which limits certain types of investments (such as aggressive extractivism) that we should be striving for. Monge also calls for the Peruvian public to seriously question the government`s vision that if we remove all obstacles for the extractives, they will lift the country out of its problems. A profound and urgent debate is needed to determine what kind of future the country wants – if it wants to promote sustainable agriculture, tourism, stimulate the internal markets, and contribute to the fight to ensure the future generations have a future, or if it wants to continue with the short-sighted, environmentally destructive plan of giving up the environment, and the worker, to the highest bidder. Despite these objections from civil society, analysts, academics, foreign and international institutions, the paquetazo has been approved, ignoring the fact that it is neither legally nor socially viable. It is yet to be seen whether the government will be held legally accountable to the agreements it violates, but there is little doubt that this ´offering´ to the multinationals will lead to more social unrest. There are currently 148 socio-environmental conflicts and seven out of every 10 of those are mining-related. Therefore with this red carpet policy that will benefit not only the mining sector but also the hydrocarbon and lumber industries, the government has firmly placed itself in opposition to its people. How will Humala regulate the unrest that will come? The answer comes in the form of an ex-military commander who is known for his heavy-handedness. Daniel Urresti was sworn into the post of Interior Minister (the seventh of Humala`s term to date) on June 24, just a week before the passage of the paquetazo. Urresti, before he accepted his post as Minister, was heading up the crackdown on illegal mining in Madre de Dios, an operation which gained much criticism for its alleged human rights abuses. However what is most controversial about Urresti is that he was forced to admit, after accepting his job offer, that he is under investigation for the murder of a journalist in 1988 when he was an army intelligence officer, and that he was allegedly the leader of a military patrol that ambushed two journalists. The journalists were attacked by a group of soldiers in plain clothing while they were investigating the killings by Shining Path rebels. One man, Eduardo Rojas, escaped, while the other was captured and killed by explosives. Urresti claims “he has no blood on his hands” and Humala has accepted this, claiming there is not enough evidence to convict him. This conclusion, however is that of Humala’s lawyers and not the result of a criminal trial. Rocio Silva Santisteban, National Coordinator of Human Rights in Peru (CDDHH), disputes the lack of evidence claim, citing several living witnesses who can testify to Urresti`s culpability. Like the paquetazo, however, Humala continues with his plan despite the public outcry, and announced on July 9 that Urresti will head up the National Human Rights Strategy – a decision the CDDHH finds scandalous. The coming weeks and months will start to reveal the true cost of the paquetazo, as the laws begin to take their effect. This, coupled with previous laws of Humala`s government which criminalize the right to protest and give police and state forces impunity for any acts of repression, presents a very worrying scenario for the Peruvian people. International observation and pressure needs to be stepped up, not just on the actions of the Peruvian government, but also on the powerful business lobbies who lie behind these actions. 1- Christian Elquera “Organizaciones de sociedad civil rechazan reducción de competencias del MINAM” La Mula, June 19, 2014. Available online at: https://redaccion.lamula.pe/2014/06/19/organizaciones-de-sociedad-civil-rechazan-reduccion-de-competencias-del-minam/christianelguera/. Accessed July 24, 2014. 2- “Humala: “Este no es un paquetazo, son medidas para reactivar la economía” Peru21, June 24, 2014. Available online at: http://peru21.pe/politica/ollanta-humala-paquetazo-economia-paquete-castilla-2189400. Accessed July 24, 2014. 3- James Brooke “Peru´s Poor Feel Hardship of ´Fuji Shock´ Austerity” New York Times, August 12, 1990. Available online at: http://www.nytimes.com/1990/08/12/world/peru-s-poor-feel-hardship-of-fuji-shock-austerity.html. Accessed July 24, 2014. 5- Alberto Niquen G. “Que el paquete Castilla regrese al Poder Ejecutivo” La Mula, July 3, 2014. Available online at: https://redaccion.lamula.pe/2014/07/03/que-el-paquete-castilla-regrese-al-poder-ejecutivo/albertoniquen/. Accessed July 24, 2014. 6- Noticias SER “¿El fin del MINAM?” La Mula, June 19, 2014. Available online at: https://blognoticiasser.lamula.pe/2014/06/19/el-fin-del-minam/noticiasser/. Accessed July 24, 2014. 7- “OEFA multó a Pluspetrol Norte con más de S/. 20 millones por desaparecer una laguna en Loreto” Gestion, November 26, 2013. Available online at: http://gestion.pe/empresas/oefa-multo-pluspetrol-norte-mas-s-20-millones-desaparecer-laguna-loreto-2082073. Accessed July 24, 2014. 8- Walter Ortiz “Multas contra empresa minera Yanacocha supera el millón de soles” La Republica, August 26, 2013. Available online at: http://www.larepublica.pe/26-08-2013/multas-contra-empresa-minera-yanacocha-supera-el-millon-de-soles. Accessed July 24, 2014. 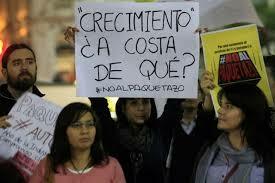 9- “OEFA confirma multa de S/.950.000 impuesta a minera Volcan” El Comercio, February 20, 2014. Available online at: http://elcomercio.pe/economia/peru/oefa-confirma-multa-s950000-impuesta-minera-volcan-noticia-1711167. Accessed July 24, 2014. 10- Oficina de Comunicaciones y Atención al Ciudadano “El OEFA impone multa de 62 UIT a Xstrata Tintaya S.A. por infracciones ambientales en la Unidad Minera Tintaya” OEFA, January 2, 2014. Available online at: http://www.oefa.gob.pe/noticias-institucionales/el-oefa-impone-multa-de-62-uit-a-xstrata-tintaya-s-a-por-infracciones-ambientales-en-la-unidad-minera-tintaya. Accessed July 24, 2014. 11- Knight Piésold and Co. “Yanacocha S.R.L. Mining Company, Conga Project, Environmental Impact Assessment, Final Report” Newmont, February 9, 2010. Available online at: http://www.newmont.com/sites/default/files/u87/Conga_EIA_English_Translation022112%20FINAL.pdf. Accessed July 24, 2014. 12- Tamara Lasheras “Defensoría pide no paralizar la fiscalización ambiental” La Mula, June 24, 2014. Available online at: https://redaccion.lamula.pe/2014/06/24/defensoria-pide-no-paralizar-la-fiscalizacion-ambiental/tamaralasheras/. Accessed July 24, 2014. 13- Alberto Niguen G. “¿A mis amigos todo?” La Mula, June 13, 2014. Available online at: https://redaccion.lamula.pe/2014/06/13/a-mis-amigos-todo/albertoniquen/. Accessed July 24, 2014. 15- Carlos Monge “¿Crecimiento? ¿Cual Crecimiento?” La Mula, April 30, 2014. Available online at: https://carlosmonge.lamula.pe/2014/04/30/crecimiento-cual-crecimiento/carlosmonge/. Accessed July 24, 2014. 16- “Instituciones se pronuncian frente al Proyecto de Ley de reactivación económica” Vigilante Amazonico, July 3, 2014. Available online at: http://vigilanteamazonico.pe/component/content/article/7-vigilancia/613-instituciones-se-pronuncian-frente-al-proyecto-de-ley-de-reactivacion-economica.html. Accessed July 24, 2014. 17- Jorge Paucar Albino “Naciones Unidas muestra su preocupación ante # PaqueteCastilla” La Mula, June 30, 2014. Available online at: https://redaccion.lamula.pe/2014/06/30/naciones-unidas-muestra-su-preocupacion-ante-paquetecastilla/jorgepaucar/. Accessed July 24, 2014. 19- Jorge Frisancho “El “paquete Castilla” también pone en peligro el TLC con Europa” La Mula, July 5, 2014. Available online at: https://redaccion.lamula.pe/2014/07/05/el-paquete-castilla-tamben-pone-en-peligro-el-tlc-con-europa/jorgefrisancho/. Accessed July 24, 2014. 20- José De Echave C. “Hay que defender el Ministerio del Ambiente” CooperAccion, June 18, 2014. Available online at: http://www.cooperaccion.org.pe/opina/43-cooperaccion-opina/2151-hay-que-defender-el-ministerio-del-ambiente. Accessed July 24, 2014. 21- Jorge Paucar Albino “¿La regulación ambiental causa desaceleración económica?” Redacción Mulera, June 24, 2014. Available online at: http://www.projusticia.org.pe/Collage/Collage_noticias_materia_ambiental.pdf. Accessed July 24, 2014. 22- Dany Valdez V “Con el afán de promover proyectos mineros, se han sobredimensionado los beneficios” La Mula, July 1, 2014. Available online at: https://redaccion.lamula.pe/2014/07/01/con-el-afan-de-promover-proyectos-mineros-se-han-sobredimensionado-los-beneficios/danyvaldez/. Accessed July 24, 2014. 23- Carlos Monge “Diversificación productive y sostenibilidad ambiental” La Mula, May 28, 2014. Available online at: https://carlosmonge.lamula.pe/2014/05/28/diversificacion-productiva-y-sostenibilidad-ambiental/carlosmonge/. Accessed July 24, 2014. 24- Pablo de La Flor “Mining and Economic Development in Peru” ReVista, Winter 2014. Available online at: http://revista.drclas.harvard.edu/publications/revistaonline/winter-2014/mining-and-economic-development-peru. Accessed July 24, 2014. 25- Amalia Syeda-Aguirre “ECONOMY: Growth, Extractives investment, Coca production” Peru Support Group, June 28, 2014. Available online at: http://www.perusupportgroup.org.uk/news-article-738.html#738. Accessed July 24, 2014. 26- “Humala Backs Embattled Interior Minister” Andean Air Mail & PERUVIAN TIMES, July 4, 2014. Available online at: http://www.peruviantimes.com/04/humala-backs-embattled-interior-minister/22421/. Accessed July 24, 2014. 27- “Es Escandaloso Que Daniel Urresti Firme Plan de DD.HH” Panorama Cajamarquino, July 9, 2014. Available online at: http://www.panoramacajamarquino.com/noticia/es-escandaloso-que-daniel-urresti-firme-plan-de-dd-hh/. Accessed July 24, 2014. Land Rights in Latin America: Where are the Voices of Indigenous Women?